Everyone knows I’m the queen of showing up and showing out when it comes to attending weddings, parties, and upscale events. 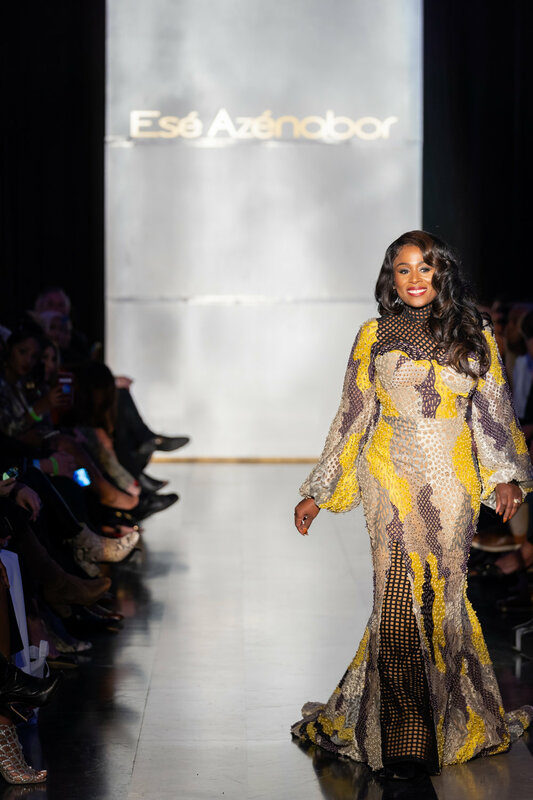 When Esé Azénabor reached out to me to be one of the 50 powerhouse women to walk the runway at her Second Annual Woman X Power Fashion Show, I said YES! I wasn’t going to miss an opportunity to strut with some of Dallas’ most influential women. Objet D’Art took place at Hall of State in Dallas, Texas. The show benefitted Action with Compassion Dallas, Inc., Founded by my good friend, Kim Olusanya. Her organization seeks ways to support domestic violence victims and reduce domestic violence in the community. Kim Olusanya, Founder of Action with Compassion Dallas, Inc.
500+ guests filled the seats. Then the show kicked off with some of the women dancing down the runway to Maroon 5 “Girls Like You” wearing black tees with words to describe powerful women. My word was BOLD! Then one hundred plus gowns kept then audience in awe for the next two hours..
Rehearsal before the show started for the introduction. I won’t ever forget how confident I felt walking down the runway. I was the largest weight I’ve ever been, yet I was fierce and bold as I glided across the floor. Esé’s designs have a way of making you feel like you’re the “IT WOMAN” in the room which is why she’s one of my favorite designers. There were so many incredible gowns from that night but here are my FAVES!!! !